Full Compatibility - This Rechargeable Battery Pack is fully compatible with the Xbox One, Xbox One S and Xbox One X wireless controller, you may get quite a few hours of playing time which just takes 4 hrs for fully charged. Safety Protection - Over charging Protection, Over voltage Protection, Over current Protection, Short-circuit Protection. 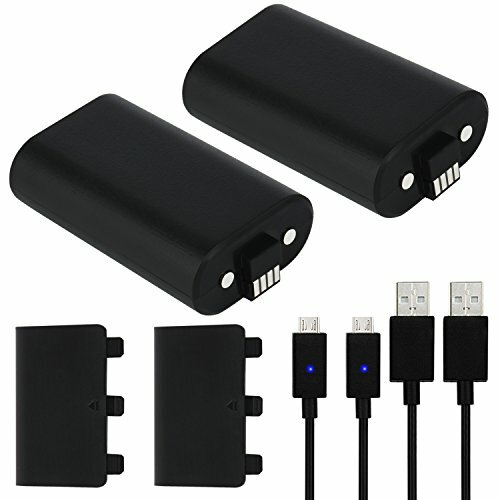 High quality 2 Pcs 1200mAH Li-ion batteries comes with certification. LED Light Indicator - This Rechargable Xbox One Controller Batteries comes with usb cables which have the little LED showing the status, Red- charging, Blue- fully charged / standby. Multifunctional USB Cables - The Micro USB cord could transfer data, so it can be used by other devices (such as a phone to PC to show as storage) or to use the controller on a PC without a wireless receiver. 100% Money Back Guarantee - All products you get from us has 12 months warranty time, just feel free to get in touch with us for anything, we are here to help you out.